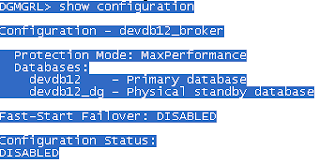 My Oracle: How to Configure the Data Guard broker? 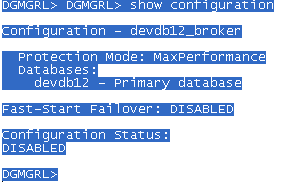 Data Guard broker is a nice tool to switch over and fail over the database in data guard environment. Using data guard broker is like a driving a car with navigation system. Hence, if broker fails in the middle of switch over, then we don't know where we are and we got to troubleshoot and see which step it failed. I personally use manual switch over and of course there are some database i use broker too. How do we configure the broker? Please follow these steps. 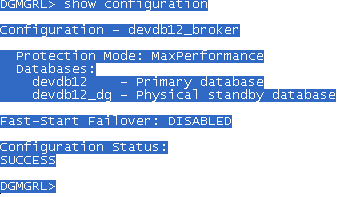 Set initialization parameter DG_BROKER_START to a value of TRUE on both databases so that Data Guard Broker background process (DMON) would start automatically whenever a Data Guard configuration was successfully implemented. Broker creates two data file to store the information. It creates on the default directory$ORACLE_HOME/dbs. We can also change the directory by using the below command. Step 2 Configuring the listener. During actions like a swichtover and a failover the Dataguard Broker interface will stop and start the instances. The Dataguard Broker Interface needs static registration of the databases in the listener.ora files. The required format is db_unique_name_DGMGRL[.db_domain]. The below entry should be in primary database listener.ora file. Listener should be up and running. The below entry should be in standby database listener.ora file. Listener should be up and running. Step 4 Add the broker for standby database. 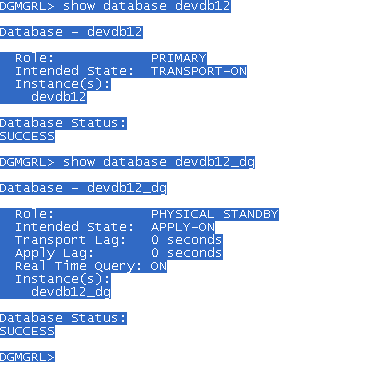 This command can be excuted only on primary database. If we have three standby then, we need to add broker config for three times on the primary database.